Designación de Presidente y Secretario de la Asamblea. Nombramiento de escrutadores y verificación del quórum legal. Recepción y bienvenida de nuevos asociados en su caso y su respectiva admisión. Elección de nuevos Miembros de la Mesa Directiva. Reporte General de la Mesa Directiva de la Asociación. Reporte del Tesorero incluyendo Balance General, Reporte de Ingresos y Egresos 2018 y presupuesto para 2019. Clausura de la Asamblea y designación de Delegado Especial. “RESCATE DE SAN CARLOS, A.C. Designation of President and Secretary of the Meeting. Appointment of scrutineers and verification of legal quorum. Reception and welcome to the new associates if applicable and its respective admission. Election of New Members for the Board of Directors. General Report of the Board Members of the Association. Treasury Report including General Balance, Income and Expenses report for 2018 and Budget for 2019. Meeting closing and designation of Special Delegate. May 31, June 1 & 2! 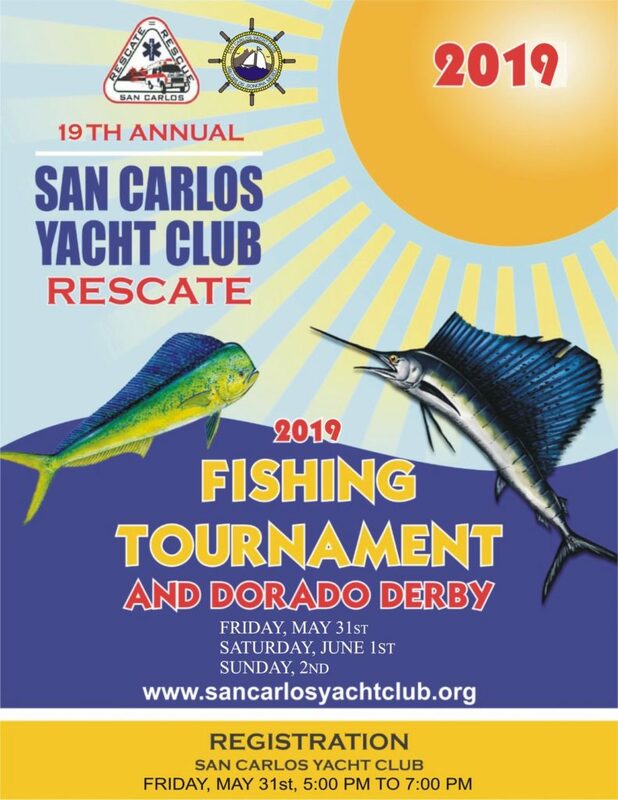 It promises to be a fun time, as always, with lots of prizes including new daily angler awards. If you pre-register before May 18, you get your boat name on your t-shirt! 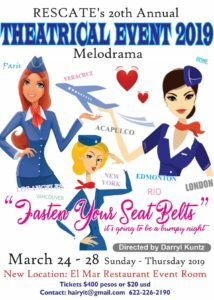 Melodrama 2019 - Fasten Your Seat Belts! 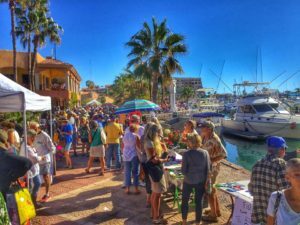 This year's show (March 24 - 28, 2019) was tons of fun - hope you didn't miss it! Our new venue - El Mar restaurant - was fantastic. Thank you so much El Mar! 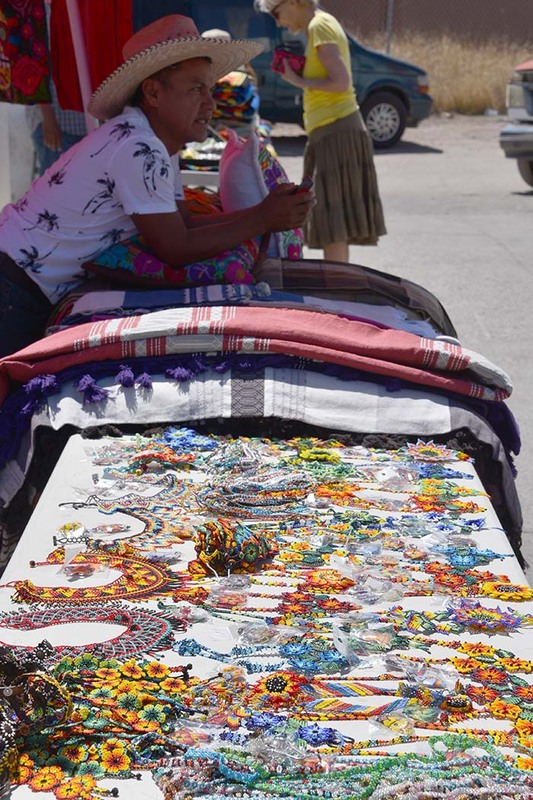 The annual Grand Bazaar was held on Saturday, February 16, from 9 am to 3 pm on the malecon near Hammerheads. It was lots of fun and well attended. Thanks for coming out to support us, San Carlos! Rescate officially launched a six-week membership drive at the San Carlos Information Session at Club Deportivo at 7 pm on Thursday, January 17, 2019. 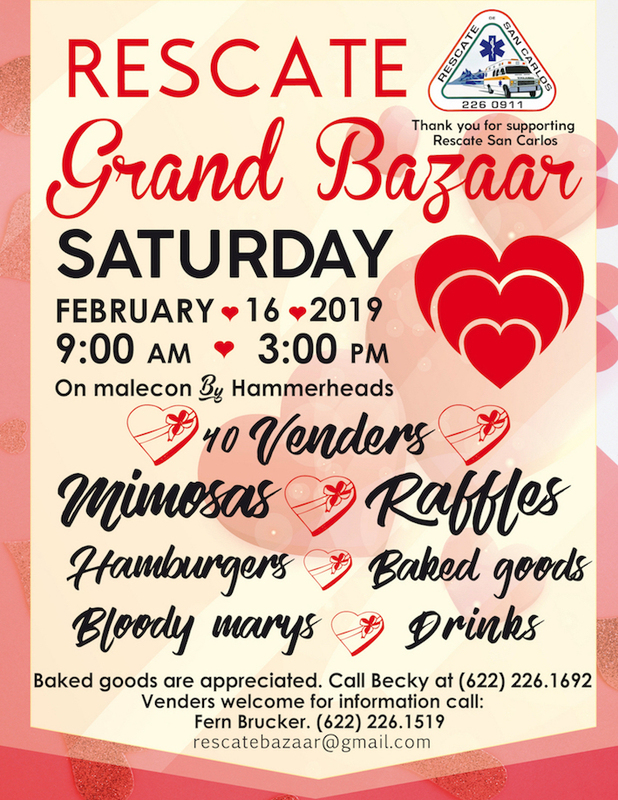 The membership drive will run until the end of February and all new Gold Card Members who join Rescate during the drive will receive a complimentary t-shirt. 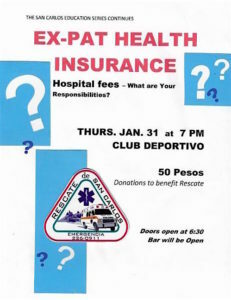 Rescate is the San Carlos ambulance and rescue service which also offers emergency first aid on a walk-in basis. For the past 40 years it has existed and thrived solely through fundraising and donations. Although Gold Card memberships are a major donation source, there are only 300 memberships at this time. Given the size of San Carlos and the ex-pat community, our goal is to double the number of memberships by February 28, 2019. Gold Card annual membership is available at three different levels, all of which are tax deductible in the United States. Gold Card memberships cover the purchasing member, immediate family and non-resident houseguests of the member. 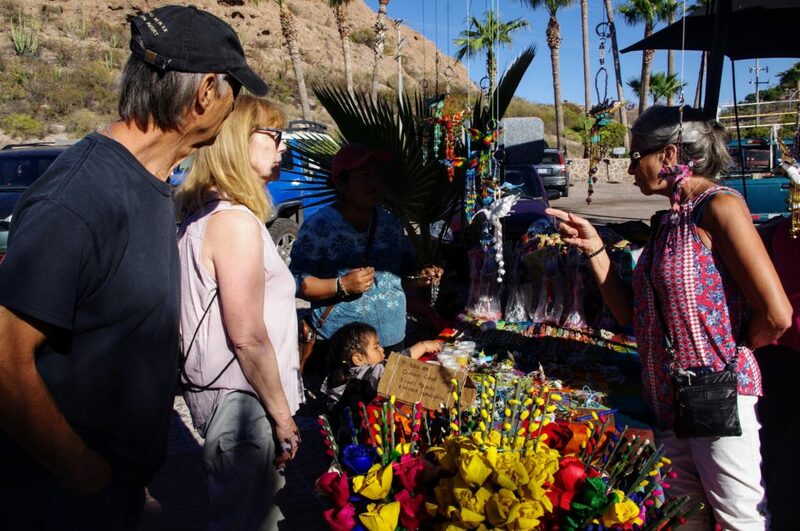 You do not need to be a San Carlos resident to buy a membership. 14 Kt. 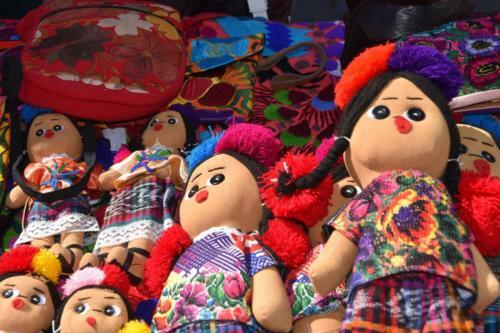 membership ($125 USD) supports Rescate and helps to keep it in your community. Physician ordered emergency transportation to other hospitals, such as CIMA in Hermosillo, via private ambulance (paid for by Rescate). Free admission to the annual Welcome Back Margarita Party and Theatrical Event. 24 Kt. 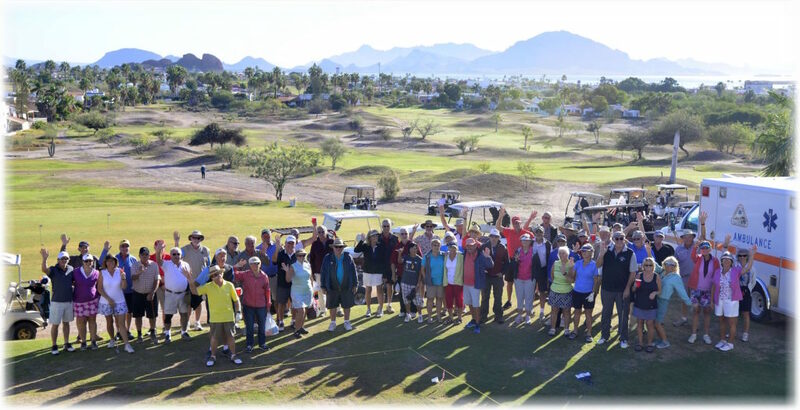 membership ($500) includes the above and two free entrance passes to the President’s Cup Golf Tournament (coming up soon on January 26th & 27th). 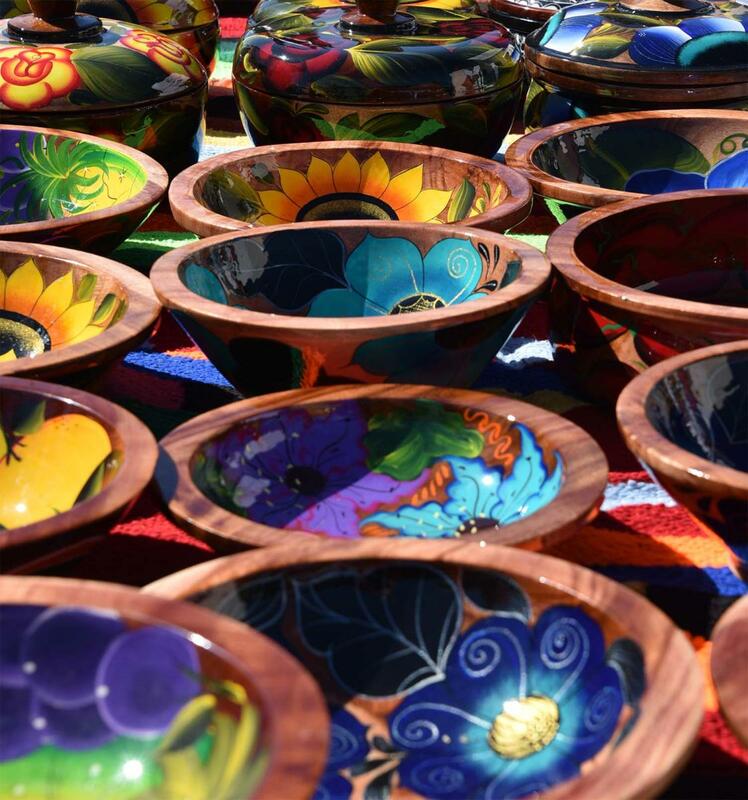 While Gold Card Memberships have personal benefits to the members, the most important role of membership is to support Rescate and keep it in San Carlos. Your participation in the Gold Card program supports the ongoing operation of Rescate as well as the acquisition of additional equipment, personnel and training that will help us continue to meet your emergency needs. Please join us at an open house at the Rescate building on Thursday, January 31 between 9 am and noon. Tour the facility and meet some of the staff! 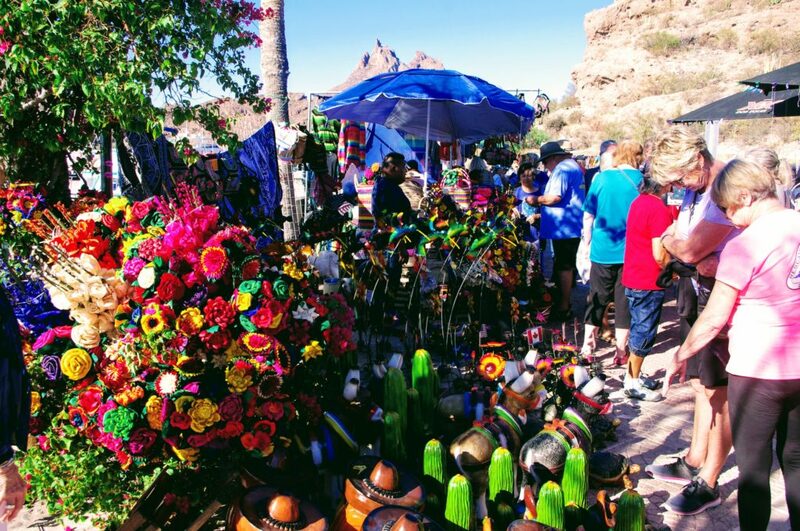 Refreshments provided by the Rescate Auxiliary. 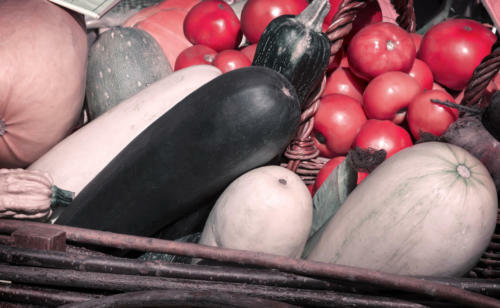 To see a summary of the information presented, see the article under the "Health Tips" tab. C Flite was the fun flite and all the players were winners! 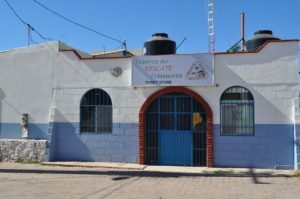 Club Deportivo Information Series Starring Rescate! 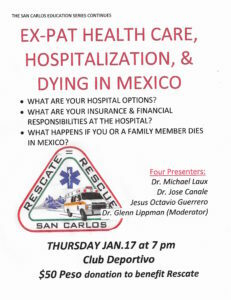 This lively and informative session presented by Rescate and local physicians was attended by approximately 215 people! What a wonderful event this year! It was so well attended that finding parking was a challenge. 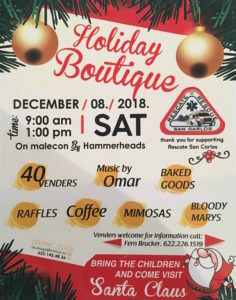 The day was warm and sunny and there were over 40 awesome vendors, coffee and baked goods, Mimosas, Caesars and Bloody Marys, raffle prizes, great music by Omar, and photos with Santa. 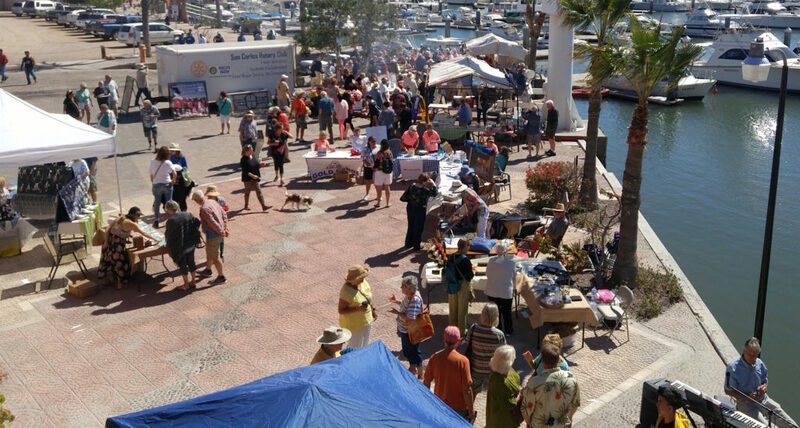 Thank you for your support, San Carlos! 2018 Welcome Back Margarita Party! 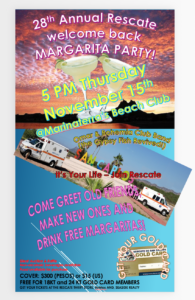 The party was held on Thursday, November 15, at 5:00 pm at the Marinaterra Beach Club. There were lots of great items available at the silent auction and through raffle tickets, the margaritas were delicious, lots of people attended and the dancing was fun! This year's big (and awesome) surprise were fireworks! (aka The Gypsy Fish Band) and many other musicians played great music for this event. Rescate thanks each and every one of them for donating their time and their great music! 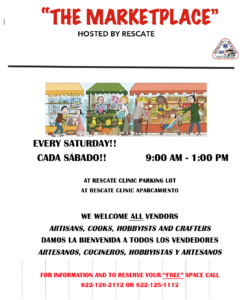 The Rescate Marketplace happens every Saturday, November through April, from 9 am to 1 pm in the Rescate parking lot. The Marketplace features deeply discounted Treasures Thrift Store items along with numerous vendors offering a variety of wares. Come check it out! 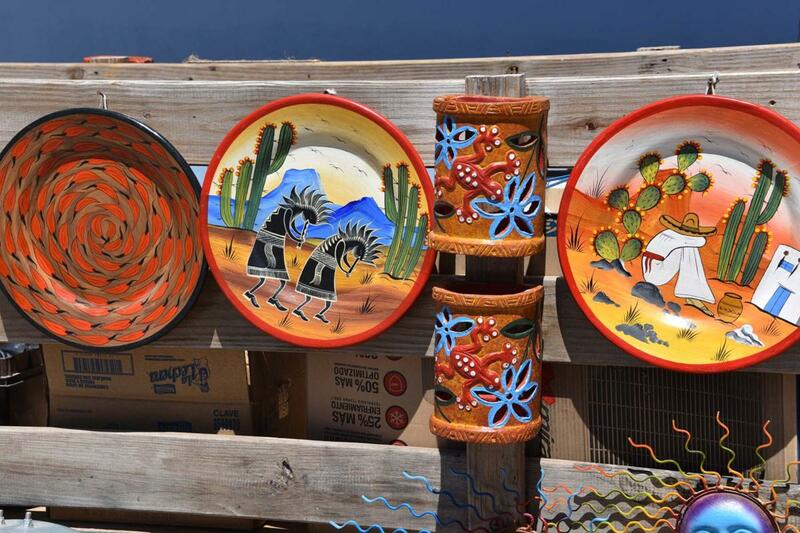 The Rescate Treasures Thrift Store is now on extended winter hours! We're open Thursdays, Fridays and Saturdays from 9 am to 2 pm, with the exception of Thanksgiving Day, November 22. Come on over to shop or donate! Donations can be made any day at the infirmary - if the EMTs are not out on a call they'll gladly accept your donations. And so will we! Thank you, San Carlos!